I just returned from a trip to Harbin, China. Not many people know much about this place except that it is really cold. Daily temperatures are about negative 15 degrees Celsius on average. 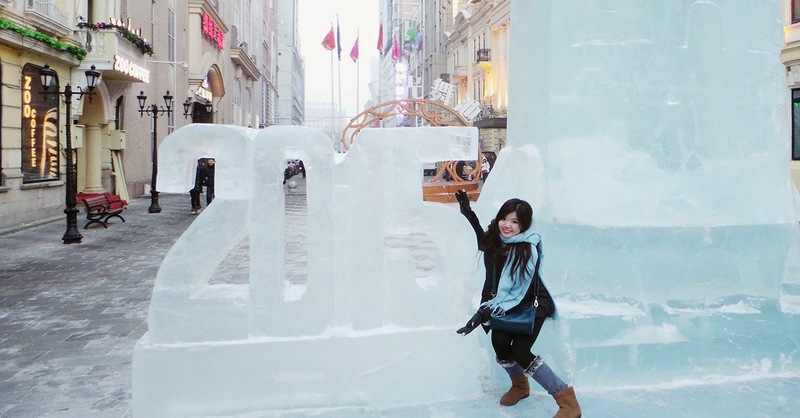 As such, I decided to write this post to share about Harbin as an amazing Winter destination. Z and I decided to go to somewhere cold for our end of year holiday and to celebrate our one year anniversary. We spent most of our life in Singapore where it is summer all year round and never experienced subzero temperatures. We chose Harbin initially because of its affordability. Other destinations like South Korea, Japan and Europe were simply too expensive for us at that point in time. Using Expedia, we managed to get a double room and air ticket for only about $775 per person via Expedia. This was a very good rate for 5 Days 4 nights, considering it was a peak travel period. We stayed at a simple and clean hotel which is called Jinjiang Inn Changjiang Road. The hotel was good with high speed WIFI and warm water always. There is also a convenience stall downstairs and many nice cafes around. However, the downsides were that the reception was not 24/7 and that it was further from the city centre. Remember to download a VPN if you want to continue accessing Facebook and Instagram. I strongly recommend ExpressVPN. It is not free but really fast. If you don’t have VPN, make sure you download the Baidu Map app because anything related to Google isn’t going to work. The best way to get around is bus. A trip only costs about 1-2 yuan (same as student price in Singapore). Do note however that the bus has no heater and service ends at 830pm during winter. Metro is also a good alternative and only costs about 3 yuan per person. So far, there is only one line but there are 5 more lines coming up. Taxi is also really cheap and starts at 8 yuan. From the city centre to our hotel (6km away), the trip will only cost 20 yuan (SG$4). As mentioned, temperatures are really cold, so please put on about 4 layers of clothes. Gloves and boots are the most important because these areas usually feel the coldest. Our first stop was the Harbin Flood Control Monument. It was built in 1958 to commemorate the thousands of people who died in years past when the Songhua river overflowed its banks. In winter, the Songhua River becomes the local sports center, with ice skating, ice hockey and ice sailing all options. You can hire the gear you’ll need from vendors along the riverbank. When I saw people skating there, I was reminded of The Dark Knight Rises 2012 where the rebels in Gotham were forced to walk on ice as a punishment by Bane and the surface was so brittle that they sank and died. While you are near the river, there will be street peddlers trying to sell sparklers and floating lanterns to you. Please do not buy the floating lanterns. They will end up in the sea and polluting it, killing innocent turtles or fish which happen to swallow them. Near the river were also some food stores which had several delicacies such as Stinky Tofu , Harbin-style sausage and Bing Tang Hu Lu. I really recommend the soya bean milk as it is really warm and nice to drink something like that in Winter. Unlike Soybean milk in Singapore, it is way cheaper and much thicker since soybeans are in abundance in this region. Next to the Flood Control Monument is Stalin Park which is beautiful but extremely cold to walk at in the night. Our entire Day 2 was spent visiting Zhongyang Pedestrian Street. It is said to be the most gorgeous street in Harbin. The architecture is really western because of Harbin’s history with Russia. In 1896, the Qing Empire granted a construction concession to Russia to construct the Chinese Eastern Railway in northern Inner Manchuria. When the railroad was opened in 1901, railroad staff lived in the town. The residents included many Russian Jews who escaped to this area during the Russian pogroms. After that, many thousands of other Jews settled there, and they took a leading role in building the new city’s buildings, businesses and schools. We spotted some people making ice sculptures. Many of these individuals are actually farmers. During winter, it is almost impossible to grow crops so they come to the city to help make sculptures instead. Ate Bing Tang Hulu everyday when I was in Harbin. I am holding the mixed fruit one but my favourite is actually strawberry flavour. While St. Sophia is known as the main architectural attraction to the city. One of the few still standing Orthodox churches in the city. It is now converted into a Harbin Museum of Architecture. Only go in if you haven’t been to a proper European church because this one can’t be compared to the churches in London, France, Italy etc. Unlike European churches, the Chinese try to keep the pigeons in one small corner. It appears that these pigeons are some kind of protected species. There is a security guard to protect them and a signboard telling people how to treat them. On our third and fourth day, we went to the China Snow Village. The city is surrounded by mountains. Due to the web-warm air from Sea of Japan and the cold wind from Lake Baikal, the snow period here lasts more than 7 months and the average snowfall reaches 2 meters! It snows mostly five out of seven days in a week. When we landed in the airport, we were approached by this local tour agency which offered to take us there for about 298yuan. This includes – shuttle bus to your hotel from the airport, trip to and from the snow village, accommodation and 3 meals. 1. You are going to be squeezing into this small bed with 3 other strangers who will most likely be PRCs. Make sure you insist on a private room. It is supposed to cost 150yuan more but you can negotiate for it to be 100yuan. 2. The costs do not include the activities. There are three activities – snow bike, walking in deep snow and hiking. They cost 360 yuan each. You can choose to do only one but the rest of the time, you will be waiting for others. 3. Bus Journey is going to take 6 hours from Harbin city to the snow village and another 6 hours back. These are the snow bikes. You have t pay 360 yuan for someone to drive you up and down again. My 4th Uncle says it isn’t worth the money. I don’t know because I didn’t try. The activity we opted for was walking in deep snow. Unfortunately, I had mild frostbite. If you don’t want to end up like me, wear boots that are waterproof and tight. The guide wasn’t very caring. She just walked in front and didn’t stop to check if people were okay. The whole time she was just flirting with a bunch of guys. I guess she wanted to get tips so its better to focus on a few warm leads rather than just treat everyone kindly. The dogs were very aggressive and hit by the people running the sleigh business. Please don’t take these sleighs and make the poor dog pull your big fat body! I saved the place which I was looking forward to visit the most for the last. This is Unit 731. Many of us would know that the Germans engaged in human experimentation on war victims during the second world war. However, not many know that the Japanese were equally guilty of it. They did so in this place called Unit731. Between 3,000 and 12,000 men, women, and children died during the human experimentation conducted by Unit 731. This number does not include victims from other medical experimentation sites. The unit received a lot of funding and support from the Japanese government up to the end of the war in 1945. These are just some of the cruel experiments that the Japanese soldiers did. At the Anda Field Experiment Ground, human targets were used to test grenades positioned at various distances and in different positions. Prisoners were subjected to vivisection. Researchers performed invasive surgery on prisoners, removing organs to study the effects of disease on the human body. These were conducted while the patients (even children and infants) were alive because it was feared that the decomposition process would affect the results. Prisoners had limbs amputated in order to study blood loss. Those limbs that were removed were sometimes re-attached to the opposite sides of the body. Some prisoners’ limbs were frozen and amputated, while others had limbs frozen, then thawed to study the effects of the resultant untreated gangrene and rotting. Not everyone who did this felt it was cruel though. Here is an excerpt of an interview with a japanese soldier. Asked why he had not anesthetized the prisoner before dissecting him, the farmer explained: “Vivisection should be done under normal circumstances. If we’d used anesthesia, that might have affected the body organs and blood vessels that we were examining. So we couldn’t have used anesthetic. Anyway if you are thinking at this moment that the United States was oh-so-innocent and some angelic hero of World War 2, that is definitely not the case. The Amercians wanted the Japanese findings about the effects of biological agents on soldiers and civilians available for its own potential military use. They not exempted the leaders of Unit 731 from trial, but put them on the American payroll. WTF. Gen. Shiro Ishii, the head of Unit 731, was allowed to live peacefully until his death from throat cancer in 1959. Those around him in Unit 731 saw their careers flourish in the postwar period, rising to positions that included Governor of Tokyo, president of the Japan Medical Association and head of the Japan Olympic Committee. Not many people know about Harbin yet. Most travelers I saw were domestic ones from other provinces in China. In fact, ZH and I were the only Singaporeans in the China Snow Village trip. However, despite looking Chinese, many could still identify that I was a foreigner. There were some who asked if I was Japanese which made me a bit worried because of the strong anti-Japanese sentiment. Another thing which caught my attention in China was the ubiquitous plastic surgery advertisements. I am so glad Singapore doesn’t allow such ads to be around to prey on women insecurities. I will be really sad if one day plastic surgery became a norm here. Personally all the procedures like trying to have a taller nose, double eye lids and slimmer face are just attempts to look more western. This is so disturbing. What is wrong with looking asian? Is there something embarrassing or hideous about having a flatter nose and wider face? I think the Chinese Communist Party placed this everywhere because they want to raise the social graces of their citizens and improve China’s image. I think Harbin people are generally well-behaved. When ZH and I were the only non-PRCs in the bus, I was worried about many things like people talking loudly, being so inconsiderate, cutting queue and smoking non stop. However, they turn out to be great. Ending off, I am happy to have come here while I am young. I think anyone who is still fit should come here once in their life. If you have kids or are old, it will be difficult to do sightseeing in Harbin due to the extremely cold weather and slippery ice which covers the floor.